Over the years, I’ve grown to love the MCU. Some of their movies aren’t great, but films like Guardians of the Galaxy and Civil War have changed my expectations when it comes to superhero films. Throughout all of these films, I’ve never gotten on board with Iron Man. I love his suit and his powers no doubt, but his attitude is something I’ve never understood. He’s not an arrogant prick simply because that’s who he is, he acts that way because he’s unstable. When I say unstable, take Avengers 1 and 2 for example. No one can argue that Tony saved the entire world with what he did in the first Avengers. Without his heroic acts, the world surely would have perished. Fast forward now to Iron Man 3. The movie was mediocre, but it focused on Tony’s emotions as he struggled with what happened in New York. He never wants that to happen again right? So he goes ahead and makes Ultron. We all saw the movie and the end result. Civil War rolls around and the situation happens in Nigeria. The mother approaches Tony and instantly, he’s on the government’s side. Why? One could argue that it was to keep heroes in check, but I saw a man who was drowning in his own guilt. He then attacks Cap and Bucky at the end when he finds out the truth about his parents. I have no problem with that, but Iron Man is quick to throw judgement at someone else in the movies and in the comics. 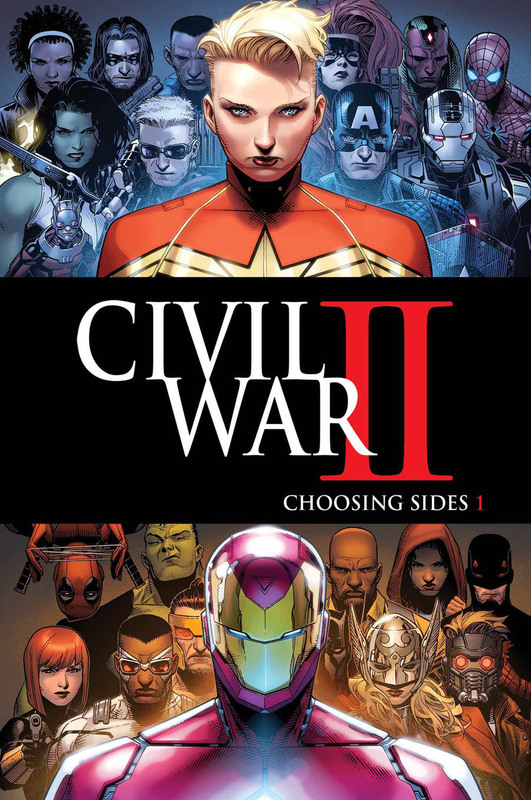 Civil War II continues to show his flaws. War Machine was killed in the last issue. It was truly heartbreaking. Iron Man has shown in the past that he will act irrationally when it comes to his close friends and family. One could argue that in Civil War I, in the comics, Cap was out of line with his actions. In the movie, since the movie was called Captain America: Civil War, it portrayed Iron Man being the one out of line. This issue starts with Iron Man sneaking into the Inhumans base to get Ulysses. He has a scuffle with Medusa and the rest of the Inhumans. Medusa and the Inhumans go to Stark Tower to try and find him. The Ultimates show up to talk to Medusa before they do something crazy. It seems as though Medusa accepts Carol’s offer. She’ll go and talk to Tony and try to settle this. Tony has Ulysses and he wants to run some tests on him to see how his brain works. Tony blames Ulysses for what happened to War Machine. The scene was hard to read because Tony isn’t acting like a hero here. He continues to talk down to Ulysses but at the same time makes little jokes here and there. He knowingly went to the Inhumans base, captured one of their own and now he’s running tests on him. Tests that Ulysses didn’t want done in the first place. All because his friend died willingly on a mission. Iron Man’s emotions continue to impede his judgement. Whether it is in the movies or comics. This entire Civil War concept is built entirely upon his anger. To me, that is the definition of a weak person, yet alone a hero. What makes the scenario even worse is that Iron Man is totally coherent. He knows his actions aren’t necessarily wise but he just doesn’t give a damn. He says to Ulysses, “I’m ninety percent sure I’m about to go to war with some very close friends of mine…over you.” He is completely aware of the consequences but chooses his way over everyone else. Moments like this have manifested themselves in the movies as well. Carol and the rest of the heroes show up later. They have an exchange of words and nothing seems to be getting solved. Ulysses then has a vision of the Hulk destroying the world. The page was terrifying to look at. It was drawn beautifully and the horror of the scene is put on full display. Ulysses then turns to the heroes and says, “The Hulk is going to kill you all.” This poses a major dilemma in the story. Iron Man said in the first issue that Ulysses’ powers would come down to this. Potentially arresting someone like the Hulk for something they shouldn’t have done yet. Carol then goes to Utah, where Bruce Banner is and the issue ends. I have voiced my frustrations with Iron Man in this review, but I’m not entirely behind Captain Marvel either. I don’t know what she’s planning to do, but my guess is she wants to lock Bruce Banner up in jail until they figure out a way to deal with this. From Tony’s side, he probably wants to get more information first before Banner gets locked up. He probably wants to see if Ulysses’ can tell him why the Hulk kills them. Both approaches to me seem reasonable. I don’t understand why they can’t come to a consensus on that. Iron Man is supposed to be Marvel’s banner character. He is supposed to unite everyone when a crisis comes up. Twice now, he’s been lured into conflict due to guilt and anger. I love reading stories like these because they’re different. But I won’t keep reading them if they become a comic book norm. I want to see good triumph over evil more than I want to see our heroes batter each other over ethics and morals. It makes them look feeble. I would recommend reading this series though mainly to see where it goes. It has me intrigued honestly. Protect the Future or Change the Future? Honestly, it should be Work Together Towards a Better Future, but our heroes love to bicker. Hopefully you enjoyed this review. I’ll be reviewing The Dark Knight Rises tomorrow and doing a comic review this weekend! As always, follow me on Twitter @Hero_Review for more updates and tweets on superhero news. Until next time!